The Lexicon name is synonymous with "the world’s best reverb." 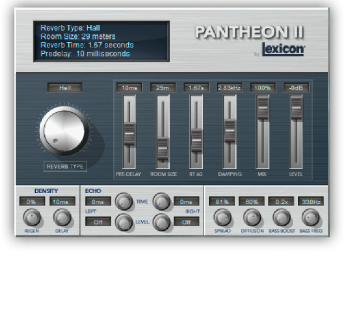 Pantheon II™ makes it easy to complete your mix and make your music sound its best with the exquisitely rich, full reverbs that made Lexicon famous. The Pantheon II reverb plug-in continues to be a value added piece of software that gives your recording that legendary Lexicon Sound. It now supports both VST and Audio Unit formats and operates up to 96kHz.